This paper aims to commence international discussions regarding the need to have a standardised approach to the reporting of biomedical information from mass gatherings. In particular it focuses on the need to have consistency in the reporting of patient presentation rates, medical usage rates, referral to hospital rates and transport to hospital rates. Additionally, it highlights the need for the consistent use of a research and evaluation tool, such as a minimum data set. This paper provides an example of a minimum data set, as an opportunity to commence these international discussions. 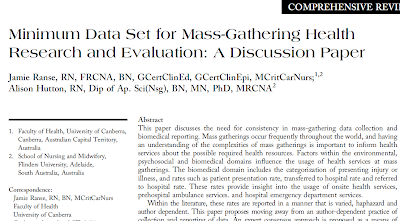 This paper discusses the need for consistency in mass gathering data collection and biomedical reporting. Mass gatherings occur frequently throughout the world and having an understanding of the complexities of mass gatherings is important to inform health services about the possible required health resources. Factors within the environmental, psychosocial and biomedical domains influence the usage of health services at mass gatherings. The biomedical domain includes the categorisation of presenting injury or illness and rates such as patient presentation rate, transferred to hospital rate and referred to hospital rate. These rates provide insight into the usage of onsite health services, prehospital ambulance services and hospital emergency department services. Within the literature these rates are reported in a manner that is varied, haphazard and author dependent. This paper proposes moving from an author dependent practice of collection and reporting of data. An expert consensus approach is proposed as a means of further developing mass gathering theory and moving beyond the current situation of reporting on individual case studies. To achieve this minimum data set with a data dictionary is proposed in an effort to generate conversation about a possible agreed minimum amount and type of information that should be consistently collected for research and evaluation at mass gatherings. Finally, this paper outlines future opportunities that will emerge from the consistent collection and reporting of mass gathering data, including the possibility for meta-analysis, comparison of events across societies and modelling of various rates to inform various health services.